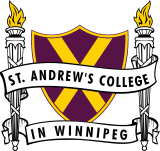 St. Andrew’s College in Winnipeg traces its beginnings to the Ukrainian Greek Orthodox Seminary which was established in Winnipeg in 1932. 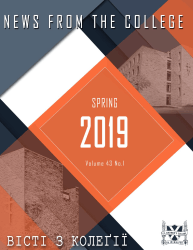 The College exists to promote Orthodox spirituality, academic excellence, cultural awareness, and leadership within the Church, the Ukrainian Canadian Community and Canadian society. In the spirit of St. Andrew`s College commitment to ensuring broader access to its educational resources, St. Andrew`s College is committed to providing financial assistance to all students who demonstrate need. St. Andrew’s College is the Theological school of the Ukrainian Orthodox Church of Canada. It offers 3 full-time programs, 1 part-time program and summer courses. 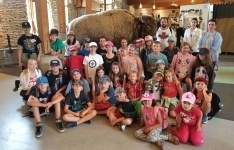 St. Andrew`s College encourages development of Ukrainian and Ukrainian Canadian culture within Canadian society and provides Orthodox witness on the campus of the University of Manitoba through its projects. Fr. Roman Bozyk, Dean of the Faculty of Theology of St. Andrew’s College, on September 24, 2018 successfully defended his Ph. D. Thesis at Université de Sherbrooke. He completed the joint Doctoral Program of Université Laval and Université de Sherbrooke. Fr. Roman wishes to thank everyone who has helped and encouraged him in this endeavour over the years. Greatest thanks of all to Dobr. Genia for her patience, strength and tireless support. Two students of the St. Andrew's College Faculty of Theology were ordained in the Ukrainian Orthodox Church of Canada. Fr. Petro Tsenov was ordained a priest and Deacon Oleh Bohdanov was ordained a Deacon by his Eminence Metropolitan YURIJ during the St. Andrew's College Feast Day Hierarchical Divine Liturgy on December 9, 2018. Administration of St. Andrew's College wishes Fr Petro & Dobrodiyka Nataliya, and Deacon Oleh & Dobrodiyka Olena great success in their continued studies and in their work in God's Vineyard, and pray that they and their families have health, happiness and Many Years. The Dr. Orest Cap Award Fund(established by Dr. Orest Cap) The Halia Balas Memorial Music Scholarship The Mr. & Mrs. Nicholas Sowsun Award(established by the Estate of Anastasia Nellie Craig) Administration of St. Andrew's College thanks them, and all of our Award Donors, for recognizing the importance of encouraging and rewarding academic endeavours. 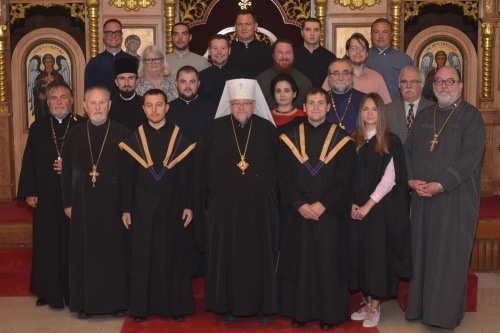 May their generousity in creating these Awards, help not only students in their spiritual formation and academic progress but also the Ukrainian Orthodox Church of Canada in its continued service to the glory of God and the salvation of His people.